Open pizza crust. Unroll. Slice into 16 squares of equal size. Place a slice of bacon, 2 slices of jalapeno, and 1 cube of cheese in the center of each square. Roll pizza crust around the filling. Pinch edges together to completely enclose. Fill a large skillet with 4 cups of water. Bring to a boil. Add baking soda. Place filled pizza dough chunks into the boiling water and cook until the dough begins to firm up, about 3-4 minutes. Transfer to a lightly greased baking sheet. Brush egg white over the top of each boiled pretzel piece. Sprinkle with kosher salt. Heat oven to 400°F. Bake pretzels in oven until golden brown, about 20-25 minutes. Allow to cool slightly before serving. enjoy! 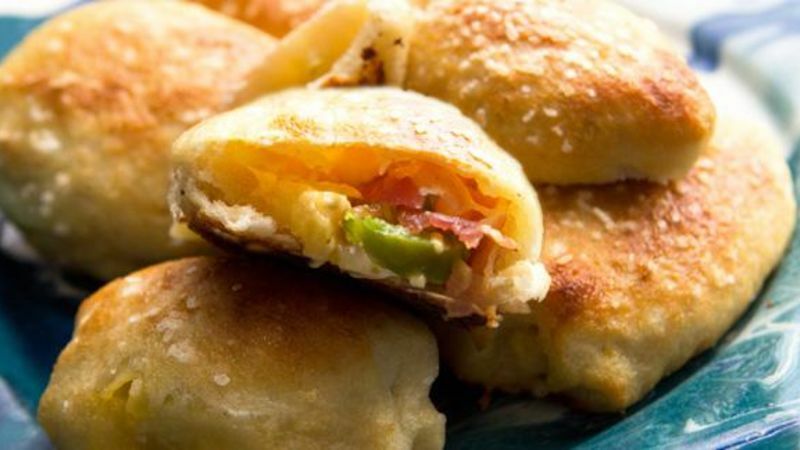 You can make these baked pretzel bites yourself with refrigerated pizza dough and some easy stuffing ingredients! Hold up – you don't have to head to the mall to get your pretzel on. With a tube of Pillsbury pizza crust, you can have a hot batch of homemade pretzels outta the oven in minutes. Better than the mall, you ask? Well, yeah huh, 'cause ours are stuffed with super-sharp cheddar, jalapeno, and bacon. You need four ingredients. FOUR. Life is seriously this easy. Tuck in the stuffing stuff. Prepare the water bath. Don't get weirded out. All pretzels need a good bath to get that fabulous chewy texture inside. So, you're gonna boil your little pretzel puffs in a water-and-baking-soda bath. It lends that mall flavor and texture to your homespun batch of yumminess. Once they've boiled like little dumplings for about three minutes, pop your pretzel puffs onto a parchment-lined baking sheet. Give 'em a quick brush of egg white and a sprinkling of coarse kosher salt up top. Way better than the mall, y'all!